Traditional weighing scales are designed for people who can easily step on to it, to weigh themselves. In hospitals however, these can sometimes be impractical as some patients may have existing medical or health conditions limiting their movements, or they may have just completed a medical procedure that requires them to limit their movement and mobility for faster recovery. Circumstances like these requires the use of specialised equipment, which would allow healthcare professionals to carry out necessary body weight measurement readings. The popular A&D HVL-CS is a purpose built chair scale, ideal for hospitals, health clinics and aged care facilities. The HVL-CS chair scale is sturdy and durable with a large maximum capacity of 150kg, and up to 20g increments for accurate measurements. Designed and manufactured in Australia to ISO:9001 quality systems, the chair scale operates on 6 x ‘D’ size batteries (or an optional AC adaptor), and automatically switches off after 3 minutes of inactivity preserving battery life. 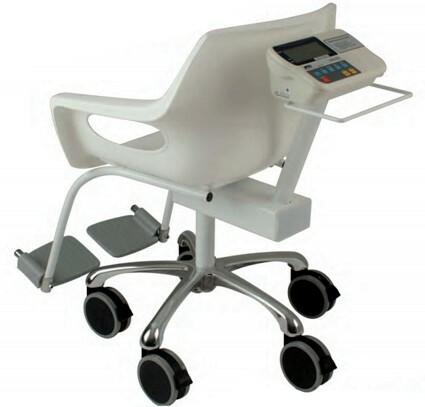 With a highly visible LCD screen, locking castors, and convenient push handles, the chair scale is very easy to operate and requires minimal effort by the patient and staff. For more information on the A&D HVL-CS Chair scale, click here. Talk to A&D today for weighing and scale solutions that are ideal for your business needs.